A month ago, Roseanne was on top of the world. Her show was in the midst of a tenth season revival that was setting ratings records and would easily finish the season as the highest-rated show of the year. The popularity and buzz around the new season sparked an interest in Roseanne reruns, and they became available and heavily promoted on various cable networks. Despite being a polarizing media presence, Roseanne Barr herself was once again becoming the most talked about woman on television, over 20 years after the end of the original run of her incredibly popular and acclaimed sitcom. Fast forward to a month later, and things look very different. Roseanne's sitcom has been cancelled, setting a new kind of TV record: the only time in television history that the #1 show on television has been cancelled (TV historians might point out that Seinfeld was #1 during its final season, but that show ended on its own terms with a planned finale and was not 'cancelled' the way that Roseanne was). Roseanne's show was not cancelled due to ratings (while viewership steadily declined over the 9-episode season, the show still ended with ratings that put it ahead of nearly every other show on television) but rather because of a racist tweet that Barr tweeted from her Twitter feed. The tweet was bad enough that several of the show's producers quit the show, and ABC ultimately felt it had no choice but to pull the plug on the series due to the unfathomably bad press that Roseanne was receiving. Considering how huge Roseanne was and how it's pretty much impossible for ABC to fill the gap in its schedule with anything that will be nearly as big, it stands to reason that Roseanne's tweet must have seriously offended ABC executives, and made them worry that the bad press would ultimately sink the network, even if Roseanne continued to draw in big ratings (certainly questionable given the level of bad press the tweet received as well as the slow but steady audience decline over the course of the show's first season). So now, after a huge revival season that reinvigorated interest in the show, Roseanne is now in a worse place than where it left off before it was revived. Reruns have been pulled from all cable networks and streaming services, and a sitcom that was once praised as a thought-provoking, all-time great sitcom has been blacklisted in just the course of a few months. It will be interesting, then, to see how the networks respond (other than possibly encouraging controversial stars such as Roseanne Barr to stay off of Twitter.) Remake fervor has hit the TV industry hard, and it came to a crescendo with the giant success of the Roseanne remake. But the quick demise of that remake shows the flip-side of what happens when you resurrect old series, and proves that sometimes, things are better left in the past. I think we all would've preferred to look back on Roseanne as a show that was great during the '90s and felt ahead of its time, rather than seeing it marred by the political division and unfortunate end of the revived 10th season. As fun as it can be to catch up with old characters, I'm really hoping this fiasco contributes to TV realizing that the answer to all of its problems isn't by constantly reaching into the past, but rather developing new, fresh series that can carry us into the future. Netflix will launch the remaining six episodes of the fourth season of Unbreakable Kimmy Schmidt on January 25, 2019. The first six episodes of the fourth season launched Wednesday, May 30. Show creators Tina Fey and Robert Carlock are executive producers alongside Sam Means, Jeff Richmond and David Miner. 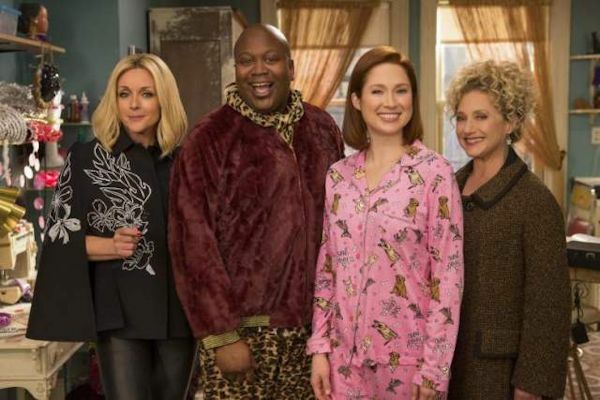 Ellie Kemper, Tituss Burgess, Jane Krakowski and Carol Kane star. To date, Unbreakable Kimmy Schmidt has earned 16 Primetime Emmy Award nominations, including a best series nom for each of its first three seasons. In Season 4, Kimmy (Ellie Kemper), Titus (Tituss Burgess), Jacqueline (Jane Krakowski) and Lillian (Carol Kane) are finding new direction in life and career. Kimmy jumps head first into her new job at Giztoob. She's ready to take on anything, except high heels, which she's pretty sure were designed by a man, or a very confused lady. By creating a fake TV show, Titus takes his acting career into his own hands. Which, as always, are covered in maple syrup. As a talent agent working her way up, Jacqueline must deal with clients who are divas, troublemakers, and have no valid social security number. All of these clients are Titus. Lillian continues to "disrupt" and "burst the paradigm," or as it was called in the '70's "general dirtbaggery."